I never felt like the special youngest child before Charlie was born. Only that one day when I was sick. Most of the time I felt like the extra kid to clothe or take to the dentist. But when Charlie came along, my parents totally changed. They doted and coddled and adored. They filled a baby book with all of Charlie's firsts, while my own baby book remained mostly blank. 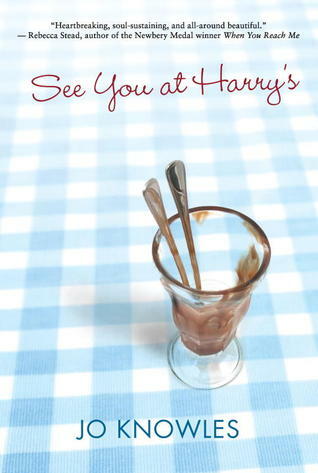 See You at Harry's is my first experience reading a Jo Knowles book but it will certainly not be my last. This book is special. And Fern, despite her resentment toward her family at feeling like a neglected child, does not come off as unlikeable in the least bit. She's a character you immediately empathize with and wish you could wrap your arms around to make up for all the affection she's missed out on from her self-centered mother and oblivious father. We get a sense of Fern's resentment at being the neglected child from the very first page when she declares that the best day of her life was the day she "threw up four times and had a fever of 103 degrees." Why was that such a special day for her? Well, it was because her mother actually spent time with her and doted on her. Until that moment and every moment after, she has felt ignored and unloved. Normally when the main character of a book is in middle school you can usually bet that it is categorized as middle grade, but because it deals partially with the main character's brother struggling with his sexual identity, I have to say that it straddles the line of middle grade and young adult. Right or wrong, there will obviously be people and parents out there who won't like the idea of their middle grade child reading about any character struggling with their sexuality and so it is bound to cause some controversy. But just as divorce has become a societal norm, so too has it become the norm to find families with children who are struggling to deal with their homosexuality. Again, whether or not you think it's right or wrong should not be the issue here. We need to put our own morals and prejudices aside for a moment and recognize that this is becoming a part of our society and we can't just ignore the fact that families are dealing with these issues. This is a book that you will struggle with because it deals with a family that is slowly falling apart. It contains a great deal of sadness within its 300+ pages, but have faith in Fern. She makes it worth your while to keep turning the page to the very end. I recently finished this book in a weekend. With my frantic schedule as the school year is quickly winding down, I haven't had time to sit down and devour a book in this way in quite a few weeks (maybe even months). But that speaks to what kind of book this is. It's one that, as Kate Messner said, "will break your heart and put it back together again."